It is unfortunate that most Christians neglect night prayers. Most families that pray together before bedtime always have a good story to tell. Prayers before bedtime are always very effective considering the fact that large percentage of spiritual activities of the witches and the wizards take place in the middle of the night. Prayers before bedtime will guide and protect you throughout the night till the following morning; therefore it is very important to pray in the night before bedtime. People who pray before they go to bed suffer less from pain, depression, anger and they are generally happier people. This book will show you benefits of praying in the night before bedtime and also reasons you need to pray at midnight hour at times. 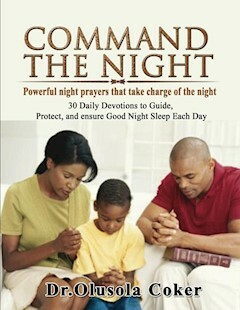 Also included are 30 Daily Devotions to Guide, Protect, and ensure Good Night Sleep Each Day. It is unfortunate that most Christians neglect night prayers. Most families that pray together before bedtime always have a good story to tell. Prayers before bedtime are always very effective considering the fact that large percentage of spiritual activities of the witches and the wizards take place in the middle of the night. Prayers before bedtime will guide and protect you throughout the night till the following morning; therefore it is very important to pray in the night before bedtime. People who pray before they go to bed suffer less from pain, depression, anger and they are generally happier people. Being involved in a good night prayer can change lives as well. There are however reasons goodnight prayer is paramount for our spiritual lives and can be an effective tool for daily life. When you pray at night, you relieve yourself from physical pain. It is generally believed that most people who pray before bedtime had less painful headaches. Prayers before bedtime keep you save throughout the night till the following day. Night prayers enable you to be disciplined. Positive Relationship and Sleep Benefits for Couples Who Pray Together at night before bedtime. In addition to praying before bedtime every day, it is always advisable to pray at least ones a week in the middle of the night because of the following reasons. Prayers at the middle of the night are always very effective. More revelations relating to your life will be known to you when you pray at the middle of the night. Midnight prayers enable you to dismantle satanic entities, thrones and chains. Midnight prayers are known to be the most spiritual active period of the day. Dreams, revelations, attacks, visitations from the spirit world (both by angels and demonic powers) often come during the midnight prayers hour. It is generally believed that midnight prayers hour is always a period of intense spiritual activities both by the Kingdom of God and the Kingdom of Satan.The Battle against the Activities of witchcraft powers is always won at midnight prayers hour. For example, look at the activities of the witches and wizards, they perpetuate their evil act at the middle of the night. The agents of darkness attack businesses, ministries, marriages and relationships, health and so on when you are sleeping: prayers before bedtime and the middle of the night will save you from their attack. The most dangerous satanic sacrifices and wicked ordinances are usually done at midnight prayer hour. Now, the Bible does not keep us ignorant of the activities that go on in the night hours. Job said: “Do not long for the cover of night; for that is when people will be destroyed (people are cut off in their place)” Job 36:20. The Psalmist calls it “the terrors of the night” (Psalms 91:5). Then Jesus said that night is the time when the enemy comes to sow tares (Matthew 13:25). You may not believe it, most of the problems we’re going through today were first shot into our lives by demonic forces while we were sleeping. Do you know that almost everything about this life is decided in the spirit realm before they manifest physically? This explains why some of us will always see things (including blessings) in our dreams or visions before we receive them physically. Does it happen to you? The same is with satanic arrows. They are first shot in the spirit realm before they manifest physically. It is therefore advisable to wake up and begin to control our midnights with midnight prayers. This is where we have the battlefield. And our exploits here will determine how great, powerful, prosperous and healthy we will become in the daytime. You need to pray the following prayer points at the middle of the night 12am-3am on any day you choose. Scriptures: Luke 6:12: It was at this time that He went off to the mountain to pray, and He spent the whole night in prayer to God. 1 Samuel 15:11:"I regret that I have made Saul king, for he has turned back from following Me and has not carried out My commands " And Samuel was distressed and cried out to the LORD all night. Psalm 119:62: At midnight I shall rise to give thanks to You Because of Your righteous ordinances. Psalm 119:148: My eyes anticipate the night watches, That I may meditate on Your word. Holy Spirit as I am about to prayer in this midnight prayers, I know I have no power of my own, please fight for me throughout the night. In this midnight prayers, I decree that any power from the kingdom of darkness attacking my life and destiny, shall catch fire and burn to ashes by the power in the blood of Jesus Christ. In this midnight prayers, I decree that any power delegated to attack my sense-knowledge shall receive the judgment of God by the power in the blood of Jesus Christ. In this might night prayers, I break every satanic chain tying me down, by the power in the blood of Jesus Christ. In this midnight prayers, I refuse to be oppressed during sleep. In this midnight prayers, I drain every poison injected into my life during sleep by the power in the blood of Jesus Christ. In this midnight prayers, I shatter to pieces the camp of the kingdom of darkness. In this midnight prayers, I decree and I declare that every coven of darkness to catch fire right now and burn to ashes by the power in the blood of Jesus Christ. In this midnight prayers, I disgrace all the principalities and powers warring against me and my family in Jesus Name. In this midnight prayers, I decree paralysis to the kingdom of darkness operating in the middle of the night in the name of Jesus Christ. In this midnight prayers, guide and protect my night hour with the blood of Jesus Christ. In this midnight prayers, I roast by fire every evil spirit operating against me and my family in the middle of the night by the power in the blood of Jesus Christ. In this midnight prayers, I command the agent of oppression assign against me and my loved ones in the night to be destroyed by thunder fire of God in the name of Jesus. In this midnight prayers, I convert to victory all the past satanic defeats in the dream by the power in the blood of Jesus Christ.